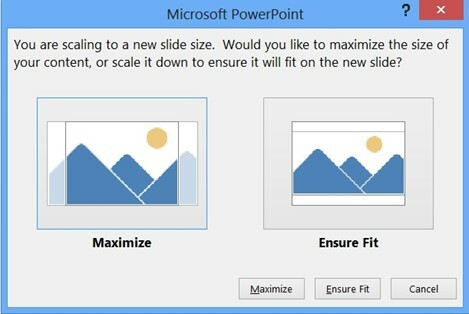 How to Change the slide size to Standard or Widescreen in Microsoft PowerPoint 2013? 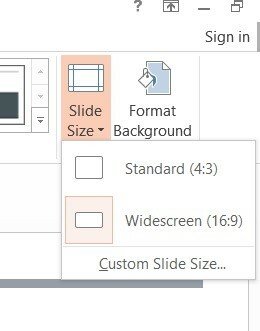 This article will explain how to change the PowerPoint slide size to Standard or Widescreen in Microsoft PowerPoint 2013. The default size of the slides in Microsoft PowerPoint 2013 is widescreen with 16:9 aspect ratio. But you can change to the standard size of 4:3 aspect ratio easily. 2. In the Design tab, click Slide Size dropdown menu. 3. Select Standard (4:3). This will prompt for a message “You are scaling to a new slide size. Would you like to maximize the size of your content or scale it down to ensure it will fit on the new slide?” as shown in the below screenshot. Select one the options “Maximize” or “Ensure Fit” by clicking on the respective buttons. 4. Soon, you will see your slide is now resized to standard size.